"The larger of my 'donut' pendants is around 4cm in diameter. Each pendant will be slightly different from any other, as I individually apply enamel powder and then fire them in the kiln. 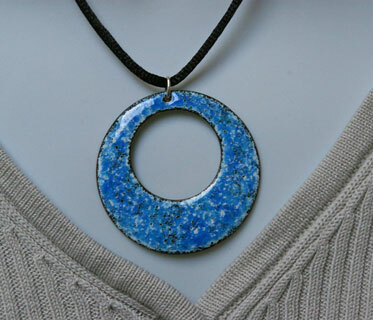 I make this necklace in a range of bright or more subdued colourways. An understated shape which you could wear when you're all dressed up, yet utterly simple for everyday wear too, the 'Donut hangs from a black cord with a silver-plated fastener. A choice of cord lengths is available. 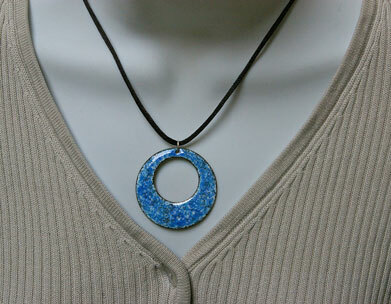 This necklace can be mixed and matched up with many of my earrings, made in the same colour range. The 'Donut" Pendant is presented in agift box."